I'm about to purchase a Brother DCP-J515W printer. As we print lots of photos, are the compatible inks you sell for use in this printer good enough for this purpose? Yes, our compatible Brother DCP-J515W inks have been stringently checked and tested to ensure that they achieve superb photo quality output which is comparable to genuine Brother inks. For further peace of mind we offer a 30 day money back guarantee on compatible Brother DCP-J515W ink cartridges so if you're ever unsatisfied with the quality you can claim a full refund. A small office that needs a compact all-in-one device can consider the Brother DCP-J515W because it combines the convenience of a colour inkjet printer, scanner, and a copier, plus the benefits of Wi-Fi in one sleek and stylish machine. The Brother DCP J515W is also aimed at amateur photographers who need a reliable multifunction printer for their photo printing and scanning needs. Compact and fairly lightweight, the Brother DCP-J515W colour inkjet printer is particularly designed for the contemporary home office. The DCP-J515W printer is integrated with a USB 2.0 interface and built-in Ethernet and Wi-Fi features. The comprehensive PhotoCapture centre comes with built-in memory card slots. The Brother DCP-J515W multifunction printer runs on 40MB of memory and it is easy to operate with a minimalist control panel and a 3.3-inch wide TFT display screen. High-yield cartridges mean more savings in the long-run for those who have the Brother DCP-J515W inkjet printer. It is energy-efficient, easy to set-up, and easy to operate. The entire device operates fairly quietly so it doesn't disrupt the working environment. Media handling is quite versatile so users can be creative on their transparencies, envelopes, glossy paper, and coated paper. 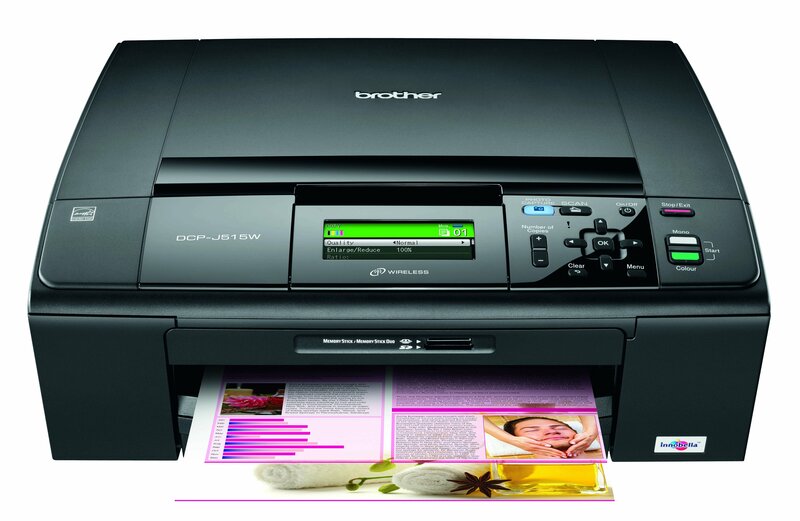 The Brother DCPJ515W supports direct printing from memory stick, SD, and SDHC cards. Pictures can be printed without borders. The scanner of the Brother DCP-J515W all-in-one printer fails to reproduce colours accurately. The absence of a colour display screen means users cannot preview pictures before directly printing them from a USB thumb drive or a memory card. Input paper capacity is limited to 100 sheets, so the Brother DCP-J515W colour printer might not be a smart choice for home offices that need to print in bulk. Users need to buy a separate adapter if they want to print from miniSD and microSD cards.